The Lord Mayor of Dublin, Ms Críona Ní Dhálaigh, the chair of Irish CND, Dr David Hutchinson-Edgar, and the President of Irish CND, Canon Patrick Comerford, at the Hiroshima Day commemoration in Merrion Square, Dublin. The Irish Government has been urged to take a leading role in an international campaign to ban nuclear weapons. Speaking at the memorial for the victims of the atomic bombings of Hiroshima and Nagasaki in Dublin’s Merrion Square, the Revd Professor Patrick Comerford, President of the Irish Campaign for Nuclear Disarmament said “a moral stance by Ireland can be effective” in bringing about change. He said nine countries together hold more than 15,700 nuclear weapons – the United States, Russia, Britain, France, China, Israel, India, Pakistan and North Korea. “Together alone, the US and Russia have 14,700 of those nuclear weapons, and they have about 1,800 of those nuclear weapons on high-alert status … ready to be launched within minutes,” he said. “The failure of the nuclear powers to disarm heightens the risk that other countries will acquire nuclear weapons. The only guarantee against the spread and use of nuclear weapons is to eliminate them without delay,” he told the gathering. 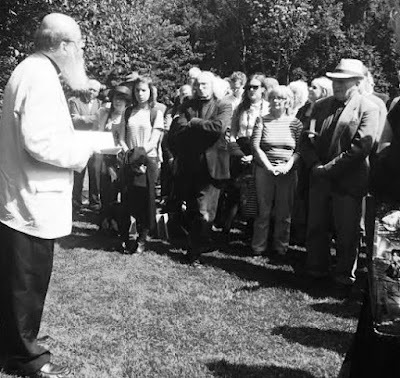 This year’s memorial, organised by Irish CND, marked the 70th anniversary of the nuclear attacks on Japan on August 6th, 1945, which killed an estimated 140,000 people in the first few weeks. The ceremony, held by Irish CND, was attended by the Lord Mayor of Dublin, Ms Críona Ní Dhálaigh, who laid a wreath at the Hiroshima Cherry Tree planted in the park in 1980, and Mr Naoki Yoshimura, first secretary of the Japanese embassy in Dublin. The ceremony also featured performances by Irish and Japanese musicians, a reading by the poet Hugh McFadden, and addresses by the artist Robert Ballagh and the chair of Irish CND, Dr David Hutchinson-Edgar. Representatives from the embassies of Austria, Egypt, South Africa, Norway, Russia and Mexico also attended. The President of Irish CND, Canon Patrick Comerford, speaking at the Hiroshima Day commemoration in Merrion Square, Dublin. 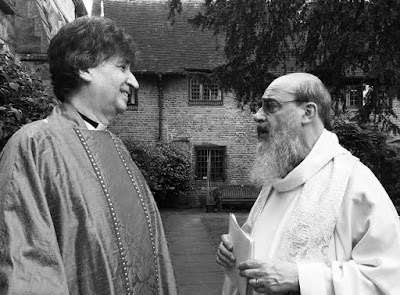 The Revd Canon Professor Patrick Comerford of the Church of Ireland Theological College was the guest preacher at the recent Festal Eucharist in the Chapel of Saint John’s Hospital, Lichfield. Canon Comerford, who is Lecturer in Anglicanism, Liturgy and Church History in CITI, was preaching at the Festal Eucharist on the Feast of the Birth of Saint John the Baptist, 24 June. Canon Comerford spoke of the chapel in Saint John’s as his spiritual home. In his sermon he recalled his teenage years in Lichfield, where he has strong family roots and where he began working as a freelance journalist with the Lichfield Mercury. He recalled how is experiences in Lichfield led to him becoming a journalist and then being ordained an Anglican priest. 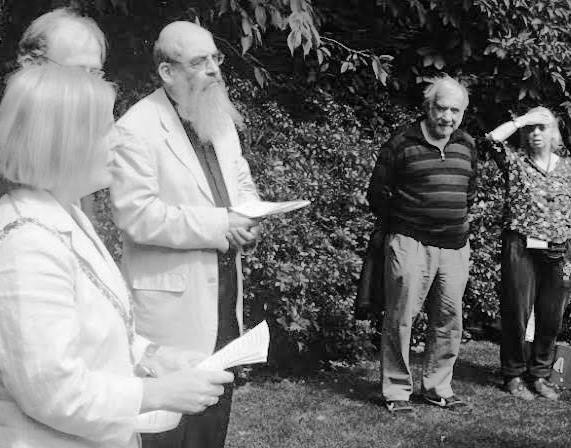 The Master of Saint John’s Hospital, Canon Andrew Gorham, presided at the Eucharist, and a reception was held afterwards in the gardens of Saint John’s Hospital, an almshouse dating back to the late 15th century. The attendance included the Lord-Lieutenant of Staffordshire, Dr Ian Dudson CBE, the Deputy Mayor of Lichfield, Mrs Sheelagh James, and former Mayor Mrs Norma Bacon.